Vladimir Zharov, Ph. D., D.Sc., who recently was awarded a $1.7 million grant by the National Cancer Institute, demonstrates the use of photoacoustic clinical device that is instrumental in his research. 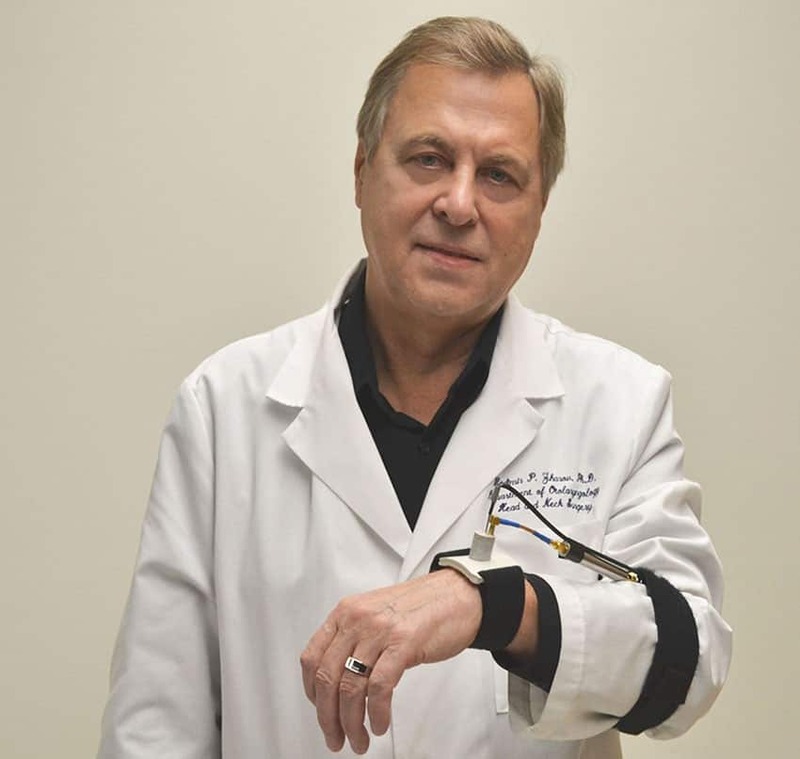 Sept. 10, 2015 | LITTLE ROCK — University of Arkansas for Medical Sciences (UAMS) researcher Vladimir Zharov, Ph.D., D.Sc., was awarded a $1.7 million grant by the National Cancer Institute for clinical testing of a new technology called Theranostics, which is an integration of early diagnosis and treatment of melanoma. Zharov has pioneered the development of identifying tumor cells’ circulation in the blood stream of melanoma patients by looking directly through the patient’s veins using a technology called photoacoustic flow cytometry. This technology uses a special laser that penetrates through the skin and superficial veins and can heat the natural melanin nanoparticles in melanoma circulating tumor cells (CTCs). The thermal expansion of these nanoparticles generates sound that can be detected with an ultrasound transducer attached to the skin. He also has developed technology using lasers to destroy the CTCs as they are identified with the photoacoustic methods. Presently, the detection of CTCs can be done by testing small blood samples drawn from patients, but Zharov’s technology is able to examine the entire blood volume for CTCs by viewing a patient’s veins (in vivo) in real time. This can improve the detection of CTCs by 1000-fold. “The goal of this translational research grant is for patients to benefit from the knowledge obtained during our study of the interaction of laser radiation with circulating tumor cells and nanoparticles, which are extremely small melanin particles,” Zharov said. “Many years ago we discovered that laser-induced high local temperature can evaporate liquid surrounding light-absorbing nanoparticles and thus create vapor nanobubbles,” Zharov said. Fast expansion and collapse of these nanobubbles significantly increases the sound10-50 fold and mechanically kills CTCs so that it requires just a few laser pulses or even a single pulse without harmful effects on normal cells. After a comprehensive study of all these phenomena in animal models and recently in pilot trails in humans, Zharov and his team are ready to develop a second generation of his technology to detect CTCs in vivo at the earliest stages of cancer. “Using Theranostics, we will focus on the most aggressive form of melanoma, which metastasizes at an early disease stage making treatment extremely difficult,” Zharov said. His team will use new high-pulse-rate lasers, which are small, focused tiny ultrasound transducers that convert physical qualities into an electrical signal. These lasers will be combined with an ultrafast signal acquisition algorithm to increase the sensitivity and minimize errors in perception due to motion that may be induced by patient hand movements. Natural melanin nanoparticles will be used as biomarkers to diagnose and as targets for therapy. Because not all melanoma cells highly express melanin, especially in early disease stages, the researchers proposed genetic, laser and nano-technological methods to increase diagnostic and therapeutic efficiency. The researchers also discovered that many standard medical procedures — especially vigorous manipulation of the tumor, certain types of biopsies and surgery — can trigger the release of cancer cells from a primary tumor into circulation, increasing CTC counts. So while some treatments can provide temporary positive effects, in the long term CTCs released during a medical procedure may cause the cancer to metastasize. To prevent this side effect of treatment, the researchers will use a portable photoacoustic flow cytometer, which analyzes particles for the real-time control of CTC release, and then eradicate the CTCs by well-timed therapy including nanobubble-based treatment. A similar approach can be used to monitor the effectiveness of the different types of treatment for cancer by counting the CTCs before, during and after therapy. The best individualized therapy will lead to a faster and more significant decrease of CTC count, and hence, decrease deadly metastasis development. Zharov’s team has already demonstrated that laser-induced nanobubbles significantly decrease the level of CTCs, leading to a decrease in the chances of cancer spreading to other organs. “Further study could determine whether these new cancer treatments are effective enough to be used alone or if they should be used in conjunction with conventional cancer therapy,” Zharov said. The clinical team will first test a large group of healthy volunteers to make sure the treatment does no harm. A metastatic tumor or hypothetically even a single tumor cell, while undetectable with existing diagnostic techniques, can release specific markers in blood that can be detected with this technique. “This is a completely new concept of early cancer diagnosis, and melanoma could be the first cancer with metastatic spread that could be treatable by well-timed therapy,” Zharov said. As a result of this project, a commercial portable cost-effective photoacoustic flow cytometer will be developed for broad application with cancers as well as infection and cardiovascular diseases by detection of bacteria, viruses, infected cells and clots with enhanced diagnostic sensitivity and treatment efficiency. “An R01 grant from the National Institute of Health is very difficult to obtain, with less than one out of 10 grant applications from researchers throughout the country being funded. Dr. Zharov has two R01 grants funded at this time,” said James Suen, M.D., chair of the Department of Otolaryngology-Head and Neck Surgery in the UAMS College of Medicine.